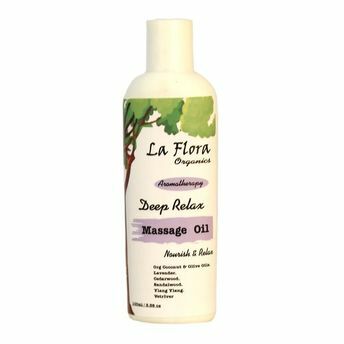 La Flora Organics Deep Relax Massage Oil is an aromatherapy blend body massage oil that is deeply relaxing and nourishing. It will leave you truly relaxed and calm. Its deep woodsy and divine scent can help you to unwind. Organic Lavender oil is a well known relaxant aroma . Sandalwood & Ylang Ylang along with vetiver invokes an earthy tone that is truly grounding. Organic Coconut & Olive Oils with Vitamin E rich Jojoba Oil will nourish & protect dull skin.